where is a n-dimensional vector of observations, is a matrix of regressors, and is a k-dimensional vector of unknowns. Notice that there is no error term. The probabilities are given in Figure 13.16. Note how the probabilities are skewed to the higher values because of the high average roll provided in the input data. A more useful inverse problem is the first-order markov process. Companies have a share of the marketplace where they do business. Generally, customers for a specific market space can move from company to company. The movement of customers can be visualized graphically as a flow diagram, as in Figure 13.17. 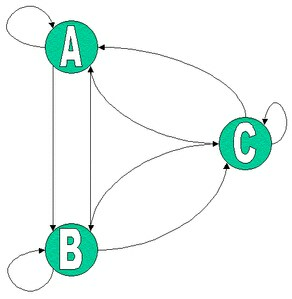 The arrows represent movements of customers from one company to another. where is a vector of k market shares at time t and P is a matrix of unknown transition probabilities. The value represents the probability that a customer who is currently using company j at time moves to company i at time t. The diagonal elements then represent the probability that a customer stays with the current company. The columns in P sum to one. Given market share information over time, you can estimate the transition probabilities P. In order to estimate P using traditional methods, you need at least k observations. If you have fewer than k transitions, you can use the ENTROPY procedure to estimate the probabilities. The following SAS DATA step statements generate a series of market shares from this probability matrix. A transition is represented as the current period shares, y, and the previous period shares, x. The following SAS statements estimate the transition matrix by using only the first transition. The transition matrix is given in Figure 13.18. Note that P varies greatly from the true solution. If two transitions are used instead (OBS=2), the resulting transition matrix is shown in Figure 13.19. This transition matrix is much closer to the actual transition matrix. If, in addition to the transitions, you had other information about the transition matrix, such as your own company’s transition values, that information can be added as restrictions to the parameter estimates. For noisy data, the PURE option should be dropped. Note that this example has six zero probabilities in the transition matrix; the accurate estimation of transition matrices with fewer zero probabilities generally requires more transition observations.